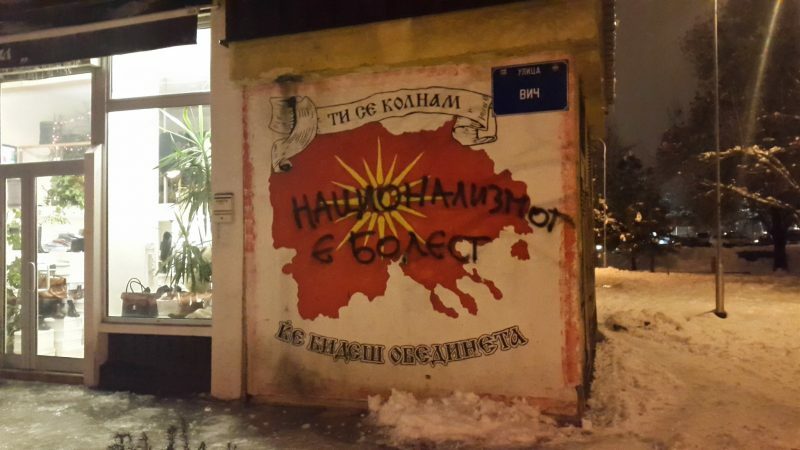 Graffiti in Skopje, Macedonia reading “Nationalism is a disease!” The message vandalizes a small mural featuring a map of ‘Ethnic Macedonia’ (encompassing the Republic of Macedonia and territories in neighboring countries) and the message “I swear to you, you'll be united!”. Photo by GV, CC-BY. A video clip made by the team of Balkon3 online magazine uses less than three minutes to explain the main absurdities of greater state nationalism in the Balkan region. Its lessons are also broadly applicable to countries suffering from right-wing populism outside the region. During the last few months the magazine has been making short videos explaining basic concepts such as civic engagement , modern democracy  and role of political parties . If this video whetted your appetite for more local commentary on Balkan mentality and culture, check out the English-language song “No Escape (from Balkan)” by the progressive Bosnian band Dubioza Kolektiv. The song's lyrics refer to regional stereotypes, as explained by a diaspora member to a Westerner.